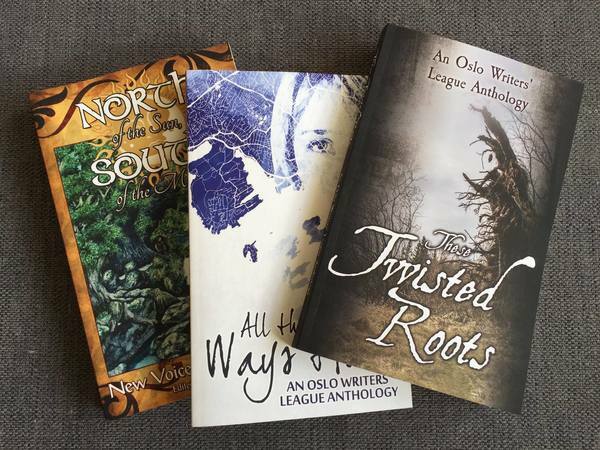 In September, the Oslo Writers' League (OWL) launched its third annual anthology, These Twisted Roots . Our whole crew gathered in one of the beautiful halls at Deichmanns Biblioteket, the main library in town, and lots and lots of people showed up to support us! (Turns out offering beer and wine for sale in a gorgeous library really brings in the crowds.) Authors read. A choir sang ( Dagsangerne på Sagene ). We auctioned off the work of our resident illustrator, Evelinn Enoksen . And all proceeds from the sale of the book and the auction--roughly 17,000 kroner on the night--were donated to Redd Barna , Save the Children - Norway, and its work aiding Syrian refugees. What a night! It's taken me six whole months to get over the excitement. Okay, okay. 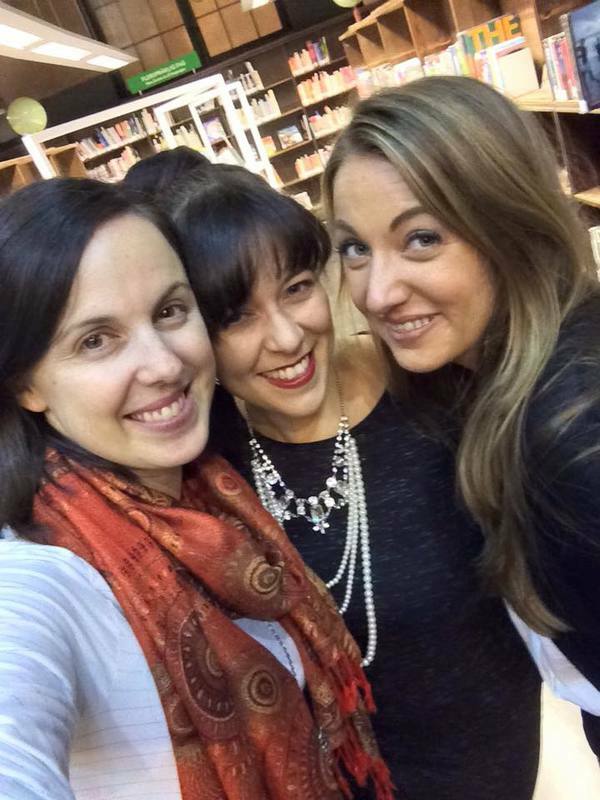 It's taken me six months to get my act together and post a blog about it. I'm writing this now with one eye on my busy, busy, busy nine-month-old daughter. She's everywhere, and she takes my brain with her for the ride. Anyway, I'm proud and happy to say that "Invisibility," which is possibly the best short story I've every written, is one of the fine works available in These Twisted Roots . You can buy your copy today via Amazon , soft cover or Kindle, or via The Book Depository , which offers free international shipping. 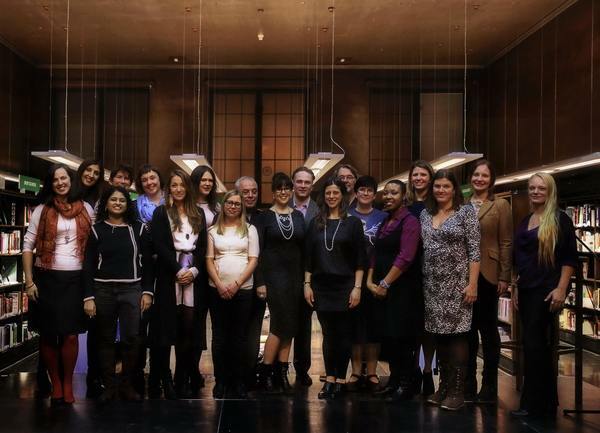 TOP: Deichmanns Biblioteket on the big night; MIDDLE: Me with my partners in crime and hilarity, the inimitable Zoë Harris and the incomparable Chelsea Ranger; BOTTOM: All the OWL authors and poets who could be present to celebrate. Such a great group! If you're a writer in Oslo, you're welcome to join us. 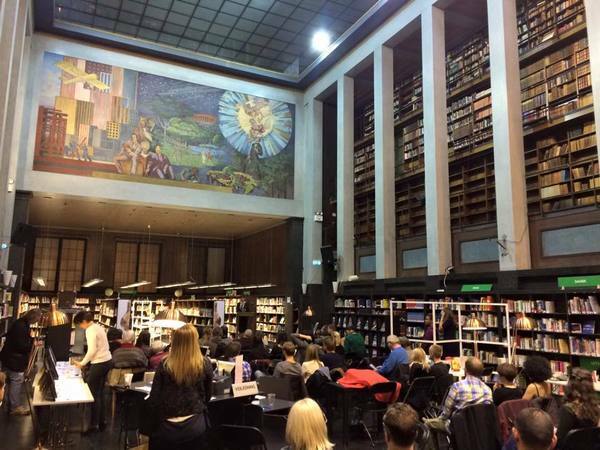 The Oslo Writers' League meets monthly in the basement of Deichmanns Biblioteket; but you can also join our Facebook group and lurk for a while until you're ready to take the next big step. We're already prepping for our 2016 anthology. Hope to see you there!